When you install one of our WiFi marketing access points and connect via your normal router, it creates a public WiFi network that is entirely independent from the network that you already have. Both networks, that public and your private network, operate simultaneously, and only share the available bandwidth of your Internet connection. The new network is completely secure and your private network retains all the security measures that were already implemented prior to creating your WiFi marketing network. Our access points are equipped with SPI and NAT firewalls. From the control panel you can set the connection time, after which a user must navigate back to the login page in order to continue using the free WiFi. This way, we avoid the convergence of too many users surfing indefinitely for too long a period of time from our access point, and thus avoid leverage, above all at points located in the hospitality industry. Unwanted downloads, such as those from peer-to-peer systems, of music, movies, or large files, will be rejected by our own system that will prevent any such connection. The new WiFi network created for marketing meets all compliance standards in accordance to the IEEE802.11n standard at speeds of up to 100 Mbps. 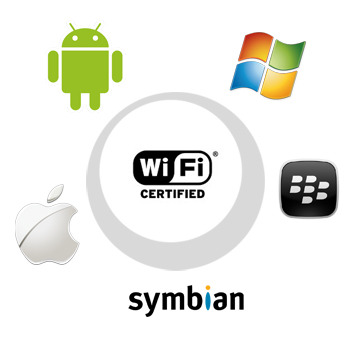 This fully supports any device with WiFi using any operating system, Windows, Android, or iOS, including iPhones, iPads, etc.